MSI introduces its GeForce GTX 780 Lightning. This card uses the company's new Triple Force Architecture, it has a custom cooling solution and features dual-BIOS. The Lightning edition is clocked at 980MHz, it has a 1033MHz boost and 3GB GDDR5 memory clocked at 6008MHz. For comparison, the reference model has a 863MHz core and 900MHz Turbo. MSI, world renowned graphics card and motherboard manufacturer, has officially announced the release of the GeForce GTX 780 LIGHTNING. This product uses the new exclusive Triple Force Architecture and is equipped with a Triple Level signals LED. The card, from the inside out, represents the next revolution thermal design. The combined power of the Twin BIOS and the card’s Enhanced Power Design equip gamers and extreme overclockers with the best graphics card. This superior performance is accompanied by a 20-phase power design that can unlock the limitless potential of the graphics card. Also featuredis the patented GPU Reactor powered back plate design which filters power supply noise and improves overclocking stability. 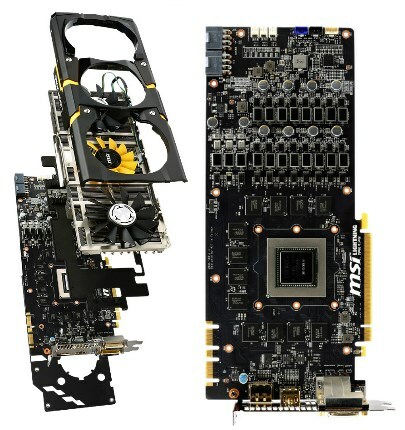 The MSI GeForce GTX 780 LIGHTNING is built using Military Class 4 components that have passed rigorous certification testing in laboratories. With such powerful components, this graphics card is guaranteed to have an impressive service life and excellent overclocking stability. Additionally, the popular 3x3 OC Kits allow for gamers to effectively monitor the status of the graphics card. MSI products are renowned for leading the industry due to the company's innovative R&D, excellent performance, streamlined thermal design, and quality components and software. 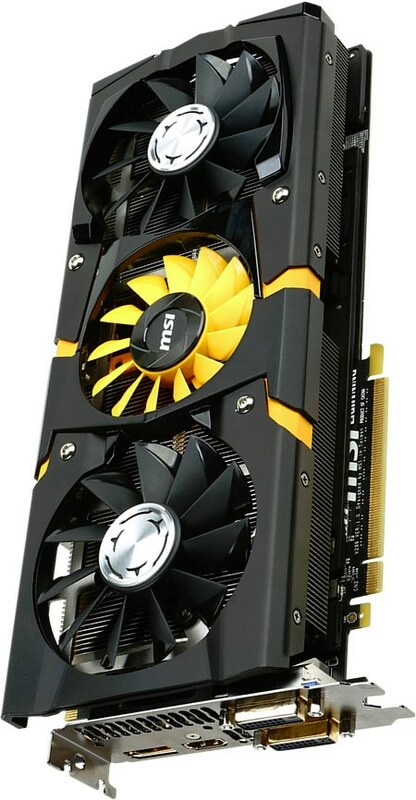 The MSI GeForce GTX 780 LIGHTNING is once again the most powerful graphics card. The latest generation of MSI's GeForce GTX 780 LIGHTNING uses Triple Force Architecture. Equipped with a Triple Level Signals LED function, TriFrozr Thermal Design with independent fan control system, and PureDigital PWM control. The Triple Level Signals LED features green, blue, and red lights that represent light, medium and heavy power loads on the device. This ensures that players have complete control over their games or the overclocking process. The innovative TriFrozr Thermal Design with independent fan control far exceeds any traditional or custom cooler’s thermal performance and ensures better cooling of the GPU, memory and PWM modules. This iteration of MSI’s exclusive design builds upon the PropellerBlade and the Dust Removal Technology of the previous model, alongside seven 8 mm SuperPipes for unrivaled thermal performance. In addition, the PureDigital PWM control technology provides a more stable and accurate voltage signal than traditional designs. The PWM's reaction time is shorter and helps enthusiasts more achieve a higher stability in the most stressful of environments. Designed specifically for overclocking, the 3x3 OC Kits are a must-have for all enthusiasts. The kit allows users to adjust the voltage levels GPU, memory, and PLL through MSI's exclusive Afterburner utility while monitoring GPU, memory, and MOFSET temperatures. V-Check Points also capitalize upon the multi meter measuring of GPU, memory, and PLL voltage levels to give users direct calibration data—a function that guarantees success in the world of extreme overclocking.